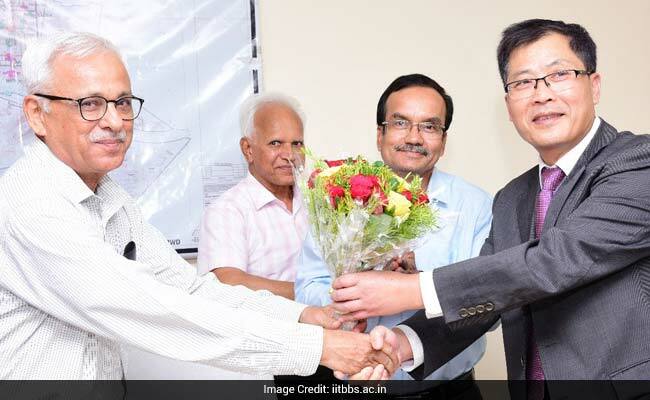 Bhubaneswar: Indian Institute of Technology Bhubaneswar (IIT Bhubaneswar) and Shanghai Jiao Tong University (SJTU), China on April 4 signed a Memorandum of Understanding (MoU) to expand the domain of cooperation between both the premier academic institutions. An MoU was signed between School of Minerals, Metallurgical and Materials Engineering (SMMME), Indian Institute of Technology Bhubaneswar and Engineering Center of Materials Manufacturing, School of Materials Science and Engineering, Shanghai Jiao Tong University (SJTU), China on 26th May 2016 by Prof. R. V. Raja Kumar, Director of IIT Bhubaneswar and Prof. Mingxu Xia, SJTU in the presence of President of India Sri Pranab Mukherjee, during his state visit to China in May 2016. As a follow up action, a delegation of four academicians from SJTU visited IIT Bhubaneswar during April 4-7, 2017 to take part in a Joint workshop on "Current Trends in Solidification Processing and Technology" to deliberate on the recent developments in the field of solidification science and processing and technical challenges faced by the community in the 21st century, to be attended by researchers from several reputed academic Institutions of the Country. Also in continuation IIT Bhubaneswar exchanged a MoU with SJTU on April 4, 2017, to further expand the domain of cooperation between them. In the absence of Director, Prof RV Raja Kumar, Prof RK Panda, the acting Director and Dean (R&D) presided over and welcomed the delegation from Shanghai Jiaotong University, China. The delegation included Prof. Jianguo Li, Prof. Mingxu Xia, Prof. Qiaodan Hu and Dr. Wenquan Lu. Thereafter, Prof. B.K. Dhindaw, briefed the members present about the ongoing major activities at the School of MMME and future roadmap to achieve greater heights in teaching and research through effective collaboration between the two Institutions.